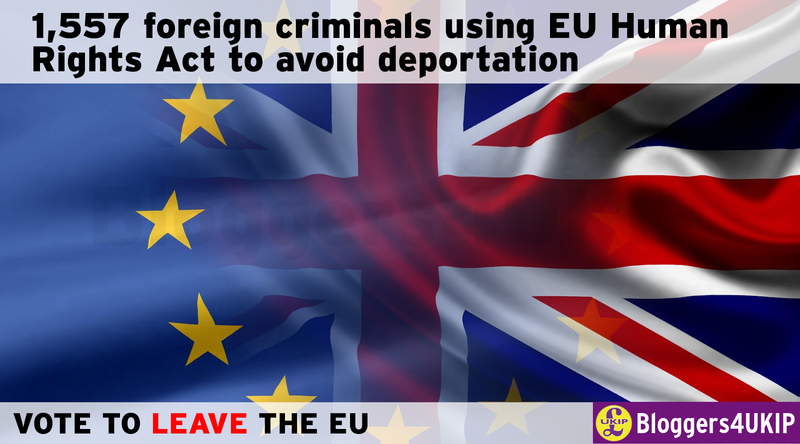 A total of 1,557 foreign criminals have use the EU Human Rights Act to avoid deportation. The favourite challenge to deportation under the EU Human Rights Act seems to be that deportation would breach their right to a family life. In such cases the fact that they have, in many cases, destroyed another family counts for nothing and as a consequence we have murderers and rapists in this country that should be rotting in a prison cell in their home country, not counting down the days until they're released and start a new life here in the UK. Over a third of appeals against deportation by foreign criminals using the EU Human Rights Act and other laws have been successful in the last five years, making a mockery of our judicial system. The EU requires all member states to implement the European Convention on Human Rights into domestic law and until we leave the EU we are unable to repeal this criminal's charter and go back to the fundamental human rights built into the English constitution starting from the 1215 Magna Carta.